The idealistic young woman was just twenty and her commitment to peace determined her choice. She was wearing a white poppy the day she traveled up to the Midlands to visit her Grandmother. It was the day before Remembrance Day when she arrived on her Grandmother’s doorstep. She’d forgotten all about the white poppy that adorned her lapel. She couldn’t help thinking that there was something odd about the reception she received from Grandmother. It wasn’t exactly what you would call warm. Her Grandmother was upset about something. But the young woman couldn’t quite figure out what, because her Grandmother appeared to be giving her the silent treatment. She just served dinner and listened quietly as the young woman chatted on about her week in London. After dinner, the young woman suggested that they pop down to the pub for a chat with her Grandmother’s neighbors. Usually, her Grandmother would have jumped at the chance to show her granddaughter off to her friends. But she seemed more than a little reluctant on this occasion. She so rarely refused her granddaughter anything, but it still took a great deal of cajoling before the young woman managed to talk her Grandmother into venturing out into the world. As they were putting on their coats to leave, the Grandmother asked her granddaughter to remove the white poppy from her coat. 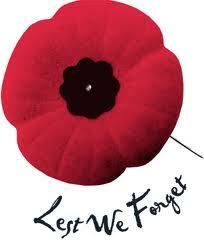 The young woman looked at her Grandmother’s red poppy and refused. She began to lecture in that pompous way that only young people who don’t know any better can about the horrors of war and the need to stand up for peace. Her Grandmother insisted that she could stand up anywhere that she wanted to for peace but not in her local, not in front of her friends, not tonight. And then their battle began in earnest. They started calmly, but firmly arguing over the damn poppies. Before long, they were shouting and eventually the Grandmother, stormed out of the house and went to the pub without her granddaughter. The young woman discretely went to bed before her Grandmother came home. Each woman slept fitfully, bemoaning the fact that they had declared their own kind of war. Early the next morning the young woman rose quietly, hoping to dash off to London before her Grandmother awoke. She was just about to make a clean get away, when her Grandmother came into the living room. She was carrying a uniform. A uniform the young woman had never seen before; a uniform that stopped the young woman cold in her tracks. Over breakfast the old woman explained that during the Second World War, she had joined the Women’s Auxiliary Air Force. The men were all off fighting and so the government had consented to letting women do their bit. Her job in the WAAFs was carried out on the home front. Every evening after she had fed her kids supper, she would send them off to the air-raid shelter with a neighbour, then she would put on her uniform and head off to the hills over Birmingham, where she would “man” an anti-aircraft gun. After telling the young woman stories that she had rarely told anyone before, the old woman invited granddaughter to come her to British Legion later that morning. Awed by all she had been told, the young woman changed her plans and agreed to meet her Grandmother down at the Legion hall in about an hour. On her way to the Legion hall, the young woman bought a red poppy and timidly pinned it to her lapel. When she finally caught up with her Grandmother, the old woman couldn’t help but smile when she saw the red poppy pinned to her beloved granddaughter’s lapel. The young woman couldn’t manage a smile. Not threw her tears. 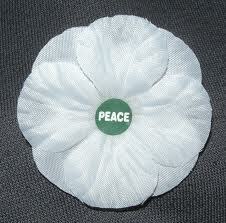 The young woman was overcome by the sight of the white poppy that was pinned to her Grandmother’s lapel. The two women fell into one another’s arms and for a moment, just a moment the two held one another other in the presence of a peace beyond words; a peace which surpasses all our understanding. The peace that only love can achieve. The peace that the world is dying to experience. As the last post was trumpeted on that cold November 11th, separated by generations, perspectives, opinions, and commitments, two women stood united in love and remembered. Together, they stood hoping against hope for peace. This entry was posted in Home, Progressive Theology, SERMONS, STORIES, Theology and tagged progressive Christian Remembrance Sermon, progressive christianity, Remembrance Day sermon, Remembrance Day story, White Poppies by Rev. Dawn Hutchings. Bookmark the permalink.